We see that Consumer Lending is the largest category with 336 companies. These companies offer new ways for consumers to obtain personal loans and have their credit risks assessed. They include peer-to-peer lending, micro-financing, big data analytics, and consumer credit scoring services. Some example companies are SoFi, CommonBond, Avant, and Lufax. Our Innovation Quadrant divides the financial technology categories into four different quadrants. We see that the Established quadrant has the most financial technology categories with 7. These categories have reached maturity with less-than-average funding. The Pioneers quadrant has 6 categories that are in the earlier stages of funding and maturity. 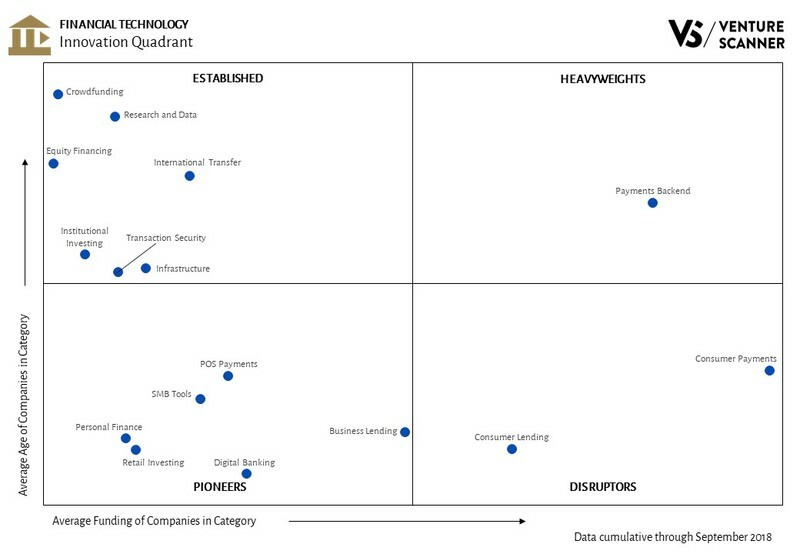 The Disruptors quadrant contains 2 categories: Consumer Lending and Consumer Payments. These categories have acquired significant financing at a young age. The Heavyweights quadrant has Payments Backend as its one category. This category has reached maturity with significant financing. 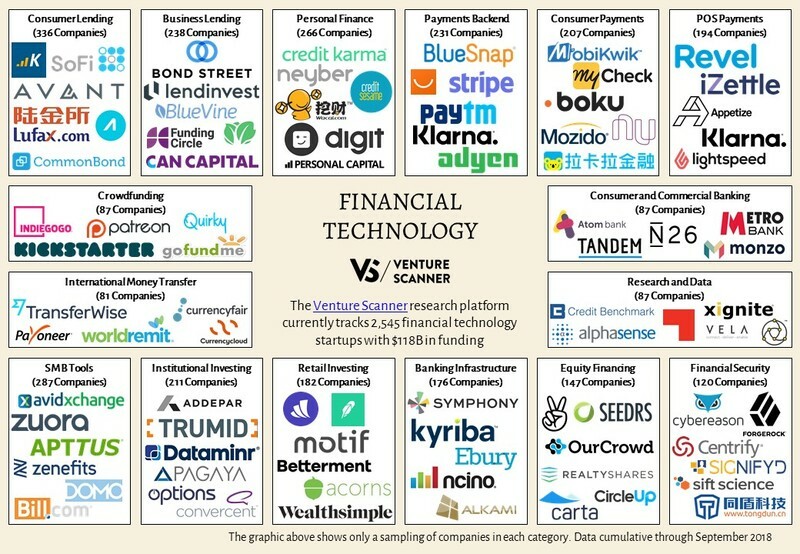 We've analyzed the financial technology categories and their relative stages of innovation. Let’s now look at how they stack up against one another in terms of their total funding versus company counts. 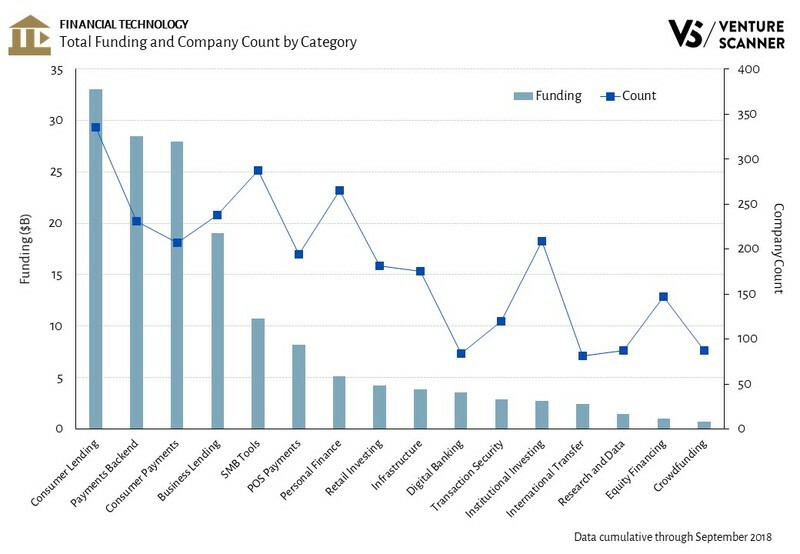 As the above graphic implies, in addition to leading in total companies, the Consumer Lending category also leads in total funding with $33 billion. Payments Backend and Consumer Payments follow in close second and third places with $28B and $27B, respectively. The analysis above highlights that Consumer Lending leads the sector in both total companies and total funding. We'll see if any of the other categories catch up during the rest of 2018.